A steady stream of rumors and released facts has been circulating, with occasional releases from Lionsgate Studios. They recently released a huge wealth of information the newly directed films based off of Suzanne Collin’s rumors. Now many of those rumors are over. The dates are set. The filming of Catching Fire has just begun, which will set District Thirteen in Atlanta, Georgia and move to the tropical city of Kauai, Hawaii during the jungle arena scenes. Like its predecessor, the crew anticipates that the filming will take four to five months, and will be released in November 2013. Lionsgate Studios are pressing for quick filming and releases to be able to release the films while Hunger Games fans are still hungry for more. There’s little to worry about. Two years after Mockingjay was released and the films came out, it earned over four hundred million in box office hits. 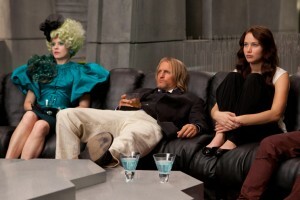 It got relative acclaim among critics, and positive reviews from most Hunger Games addicts. Hunger Games fans have something extra to look forward to besides Thanksgiving. Mockingjay will be split into two parts: The Hunger Games: Mockingjay Part One and The Hunger Games: Mockingjay Part Two, following in the footsteps of franchise Harry Potter. Each movie will be released like clockwork on the months of November 2014 and the final part in 2015. Each film will be two and a half hours long. Though the release dates are set, the directing choice is not. Gary Ross left the set after the first movies, and Francis Lawrence will do the same. Who will the final mystery director be, and will he be able to keep on track with the fast filming and vastly increased cast of the final books? Only time will tell, and for many Hunger Games addicts the wait may be a long one.